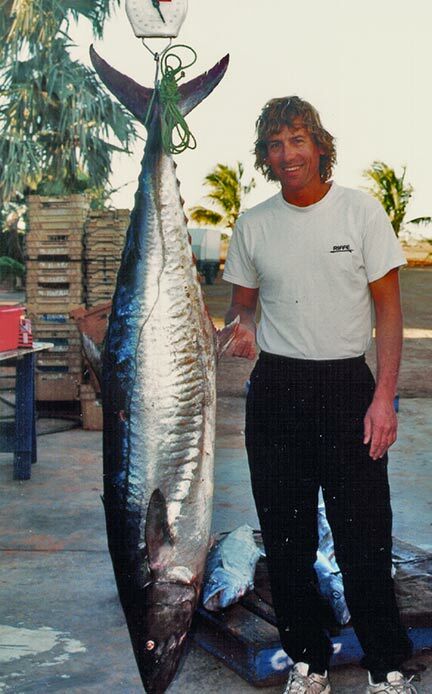 Above is a picture of Greg Pickering with largest recorded Narrow Barred Spanish Mackerel speared in the world. Greg shot this fish back in the early nineties at a time when the record for this fish would change hands six times in four years ultimately leading to Greg holding the title to this date. At the turn of the century the Mackerel were going off not just in Australia but in South Africa as well. 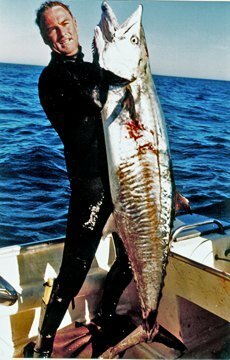 It was in July 2000 that Kevin Daly in the Natal Coast of South Africa started this epic battle of the records by landing a whopping 36.8kg monster. Kevin shot this fish with a 1.2m gun whilst shore diving and after shooting it kept diving for crayfish whilst towing it on his float line . What a legend! Ryan Springall brings home the bacon with this little 37kg spaniard. Kevin would not hold his title for even a year (May 2001) and would lose it by a mere 0.2kg to Australian Ryan Springall who would shoot a healthy 37kg specimen near Mudjimba Island located off the Sunshine Coast approximately one hours drive north of Brisbane. Again this fish was shot close to shore. In Ryan’s world record account it was only 1km from the shore in an area that receives heavy diving and fishing traffic. In late September 2001, in less than 6 months the world record would move from the East Coast to the West Coast of Australia with the legendary Barry Paxman bettering the record again by 0.2kg. Barry had just beaten the 19 year strong West Australian record and picked up the World record along the way. 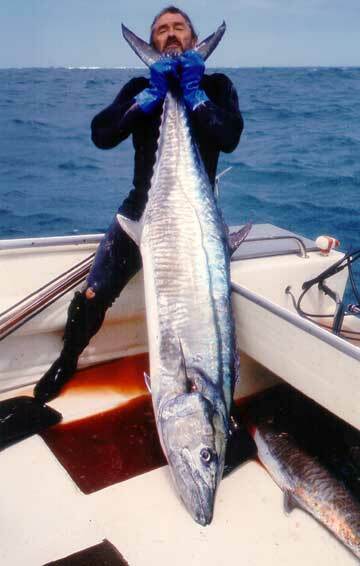 Barry was burleying up Barracuda in just 5m of visibility near the Murion Islands when he landed the 37.2kg beast with Greg Pickering who would later become the current world record holder. Add to this on the following day Barry would beat his own WA record for Long Nose Emperor. 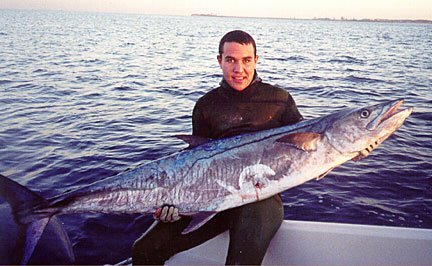 However Barry’s title was fleeting and three months later (Jan 2002) the Spanish Mackerel Spearfishing Record was again broken, this time by Ian Fearnley again at the Murion islands in just 25 feet of water in strong current. Ian was coming to the end of the day but like most of us had to have one more dive and I’m sure he’s glad he did landing a cracking 39.5kg fish just shy of the 40kg mark. In November 2003 the title would head back to the east coast with Ian Brown breaking clear of the 40kg mark with a 40.5kg fish taken at Break Sea Shoals near Fraser Island, central Queensland. Unfortunately for Ian his record was soon beaten by Greg Pickering’s 46.2kg Dorre Island giant in July of 2004. Greg passed up a school of Mackerel with fish around the 27kg mark instead choosing to wait for the “big fish” at the rear, and big it was smashing the International Bluewater Spearfishing Committees then current record by 5.7kg. A record that still stands today 11 years later. It’s been a long time since anyone has been able to take Greg’s title and maybe it never will be broken, but I’d like to think that it will. I’d like to think that there is a record breaking monster out there waiting to be speared and the fact that line fisherman came close in 2014 is very promising. In September 2014 a fisherman in Cairns Australia landed a Spanish Mackerel weighing in at 49.5kg. Unfortunately the fish lost 7kg overnight before reaching official scales. The fish was officially recorded as being 42.1kg and according to the Cairns Post is an Australian angling record but still shy of the South African angling record at the time of 42.8kg. Interestingly I could not verify these weights. Read the Cairns post article here. Even more promising is the catch of a 50kg specimen taken beach fishing on Fraser Island in South East Queensland recently. Legendary South African Spearo Rob Allen tells us about the one that got away in our interview with him. He explains that he’d shot a 20kg fish only to have what he estimates to be a 60-70 kg monster come in while he was dealing with his fish on his spear. I can only imagine how frustrating that must have been. What is your PB spanish Mackerel is and where did you take it?